If you grow fruits or vegetables at home, you're probably as frustrated as I am trying to determine when they are just right for picking. Mettler Toledo, a company that has helped big growers, canners, and bottlers determine this answer for many years, has now created a portable measuring gadget for us small guys: the Quick-Brix™. 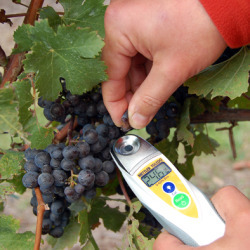 Most food and beverage growers and processors use a Brix device, generically called a refractometer, to detect the amount of sugar (carbohydrates) in a food. The measurements are compared to a Brix index for fruit and vegetables, a chart which shows what is poor, fair, good, and great proportions of sugars for each fruit or vegetable. 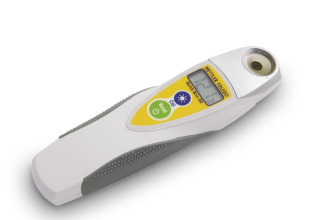 But the industrial refractometer is more cumbersome and complicated, than a small grower, winemaker, canner, or homemaker needs. Mettler Toledo's Quick-Brix is a portable gadget. Just squeeze a bit of juice from your fruit on its prism, press the read key, and you get the result. The temperature of the juice doesn't matter; the Quick-Brix has a built-in temperature adjustment which converts the reading to 20° centigrade. You can rinse the Quick-Brix with water or wipe it off with a tissue. For those of you with refractometer experience, the Quick-Brix yields are consistent regardless of operator. There are two Quick-Brix models: the Quick-Brix 60 for testing agricultural products, and the Quick-Brix 90 for food or beverage makers. Quick-Brix 60 has an accuracy rate of ± 0.2 %, and Quick-Brix 90 has an accuracy rate of ± 0.1 %. 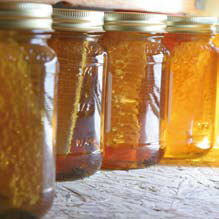 No mention of the cost but for home canners and brewers this would be a great tool.